By Catherine Devane | September 26, 2017. 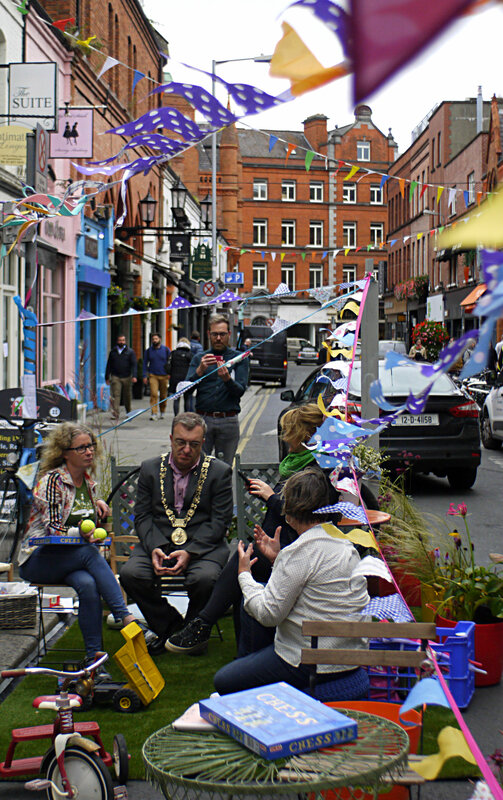 What is PARK(ing) day? 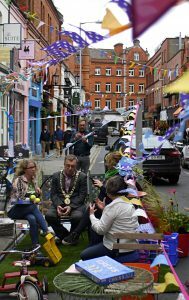 Well, the concept of PARK(ing) Day is simple: on the third Friday of every September, local businesses turn a parking space outside their building into a small sanctuary. Started by David O’Connor, Stéphanie Fy and Sinéad Bourke in 2011, the event follows the example set by San Francisco, who created the event back in 2005. O’Connor, a planning lecturer in Dublin Institute of Technology, and architects Fry and Bourke, saw it as an opportunity to bring a global event to Dublin. 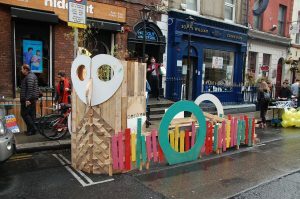 Though PARK(ing) Day was more prominent in the city centre, on a gloomy Friday I ventured around the historic area of the Liberties to see who had taken part in the area. Without a doubt, Francis Street was the immense winner. One usually grey and dull parking space had been floored with black and white tiles, together with embellishments of toilet and life size white and pink polka dot bathtub. Other ornaments like pink stools and bunting adorned the makeshift bathroom. Finally, alongside the rim of the car park space was a neat white picket fence. Standing by the space were two young volunteers, Sam and Hugo, who were handing out biscuits to passersby. After knocking on the door of the buildings facing the parking space, I was greeted by Robert Higgins from DHR Communications. As we chatted, I learned that the unusual set up was made by his workplace and another management company next door, Cuckoo Events. “The theme of our design is tranquillity and peace which for a lot of people is the bathroom. We collaborated with Oxfam for the project, as we wanted to draw attention that not everyone has the luxury to their own bathroom; like asylum seekers and homeless people,” said Higgins. 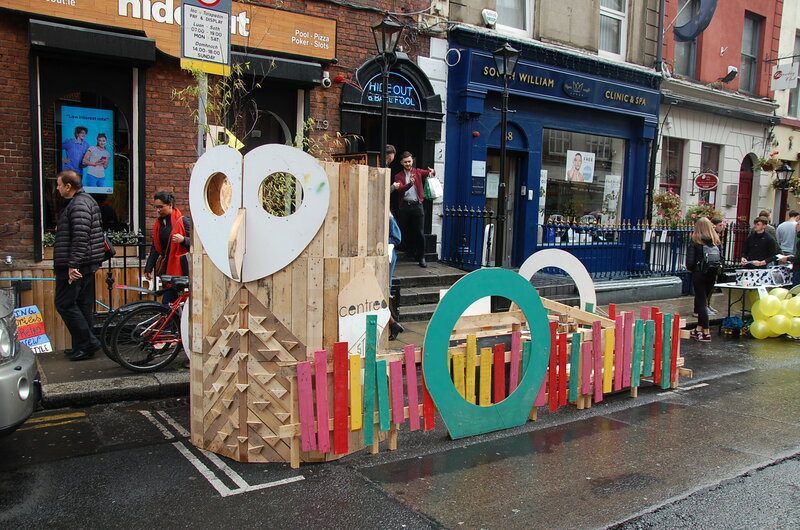 The design, which took about an hour to put together was also the first time the business had taken part in PARK(ing) Day. Finally, what’s the future for PARK(ing) Day? “I would like to see it evolve into something bigger and better. I would also love to see more people getting involved, because without people being active in changing our city the results will fall short.” Faolán says. It’s food for thought for local businesses around Dublin. The day not only creates a more colourful city but it also involves a community coming together to make something beautiful. 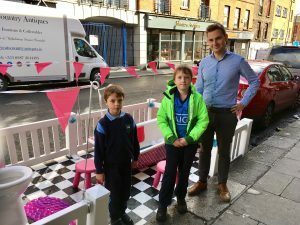 It seems PARK(ing) Day will only grow stronger, with this year proving to be the biggest success to date with 27 installations all over the city.